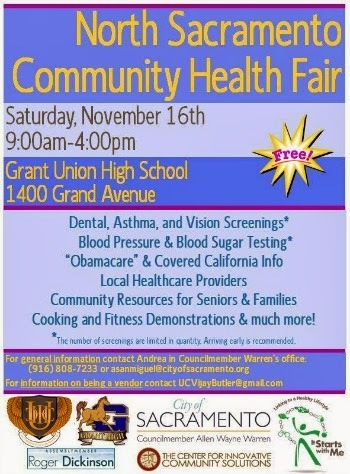 The North Sacramento Community Health Fair takes place this Saturday, November 16 from 9am – 4pm at Grant Union High School. 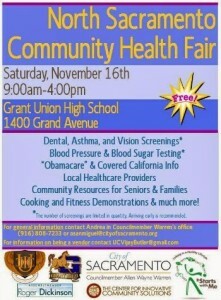 The free event includes Obamacare / Affordable Care Act and Covered California information, local healthcare providers, community resources for seniors and families, cooking and fitness demonstrations, dental, asthma, vision, blood pressure, and blood sugar testing and screenings (limited in quantity, so arriving early is recommended). For more information, contact Andrea in Councilmember Allen Warren’s Office at 916-808-7233 or asanmiguel@cityofsacramento.org. The event is sponsored by Councilmember Allen Warren, Assemblymember Roger Dickinson, and The Center for Innovative Community Solutions. November 14, 2013 in Affordable Care Act, Allen Warren, Covered California, Del Paso Heights, Event, Grant High School, Health, Health and Wellness, Roger Dickinson.